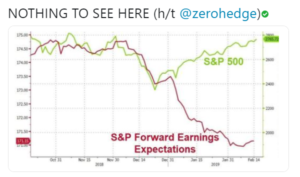 This chart got a lot of play on Twitter on Friday and Saturday morning and it tells an important, but also stimulates a more important question (maybe): Just how far out does the SP 500 (the index) discount earnings data ? The 12-week change and the y/y change is still deteriorating or becoming more negative. Summary / conclusion: My own expectation for SP 500 earnings for 2019 was “low teens” (I was thinking more precisely 13%, versus last year’s “organic” growth rate – ex tax reform – of 14%) and that might be too high. But here’s the rub: in 2018, SP 500 earnings grew mid-20% with tax reform, and the SP 500 returned -4.35% in calendar ’18. It was a year of sharp P/E contraction to say the least. In 2017, the SP 500 returned over 22% while SP 500 earnings grew 12%. So for what period can we reasonably expect the SP 500 index to discount forward earnings ? Conventional wisdom says the US stock market looks 9 – 12 months forward, so 2019’s early price action is currently discounting Q4 ’19 and potentially 2020 SP 500 earnings growth. The year-over-year drop in expected Q1 ’19 earnings seems well discounted in the benchmark already. Financials got a nice pop this week after it was disclosed Berkshire Hathaway was a buyer with the latest 13-F filings: JPM, USB, BK, TRV, PNC, BAC were all mentioned as Financials where Berkshire had increased their stake in the names. Financials continue to be an overweight sector in 2019 for clients, after a tough 2018. Schwab, JP Morgan, CME, the XLF, and the KRE are all top 10 positions for clients. The flatter yield curve is not helping the sector. One positive for the sector is that – despite deterioration in the SP 500’s expected growth in 2019 – expected earnings growth for Financials for 2018 has been stable, at just above 9%, better than benchmark. That’s a plus.